18 :: Gerrards Cross Golf Club is considered one of the most attractive courses in South Buckinghamshire. Kindly sponsored by Spire Thames Valley Hospital. A long par four dog-leg left and another panoramic view of the Misbourne valley from the elevated tee. 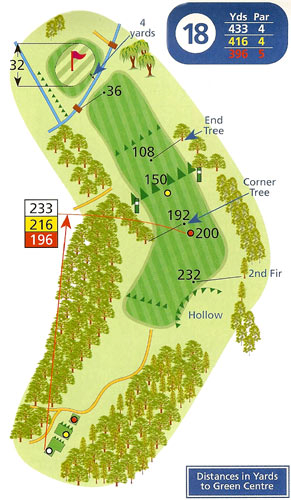 Low handicap players will again attempt to cut off as much of the corner over the trees as they dare, their reward being a relatively short iron shot across the River Misbourne to a large gently sloping green. High handicap players taking the safer straight line will be unlikely to reach the green with their second shots and have to settle for a pitch and putt par.